Don't get out of the water to clean up grit. 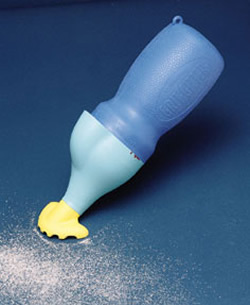 The small, 9"-long Grit-Gitter floats in your tub and is always handy. It's great for vacuuming the filter compartment, tight corners, and hard-to-reach areas. There's no need to get out, nothing to hook up, and nothing to plug in. It's so much fun you'll have to wait your turn to use it!Patent-pending designThe Grit-Gitter is of the highest quality, designed to last. Disassembles easily for cleaning. So easy to use.Just 3 simple steps. By submerging the Grit-Gitter with the bulb end down. Squeeze the bulb one or two times to help remove the air. In one smooth easy motion, squeeze the bulb, and releasing the bulb quickly, move the GRIT-GITTER forward (3 to 6 inches) over the grit. A momentary delay before squeezing again works best. Not only does the GRIT-GITTER make cleaning easy, it cleans easily too. Just empty the contents outside your tub and rinse the screen. Clean frequently, or whenever squeezing the bulb squirts grit and water out of the nozzle. To empty the debris, rotate the bulb counter-clockwise 15° and pull the bulb/ring straight away from the body. Dump the contents outside the tub. Fill the bulb with water and pour over the screen to rinse all the debris off the screen. Be sure no debris remains in the connection area so that there is no interference when you reassemble the bulb to the body. To reassemble, line up the red mark on the body and the red dot on the ring. 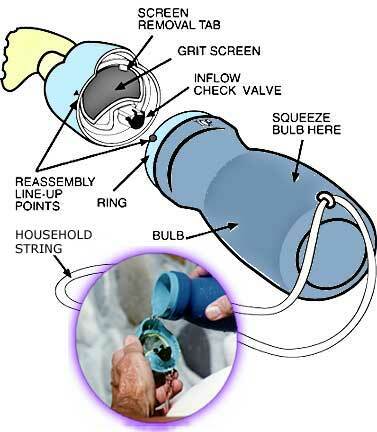 Push the bulb into the body and rotate the bulb clockwise 15° until the ring locks in place. NOTE: Anything larger than 3/8" in diameter could dislodge the GRIT-GITTER's inflow check valve. If this should happen, empty the debris and reattach the check valve by hooking the posts into the appropriate slots. The GRIT-GITTER is designed to come apart under stress to prevent parts from breaking. If your GRIT-GITTER should come apart, simply reassemble it as you would after cleaning.